All eyes are on the tiny child, perhaps seven or eight years old, as she gingerly but quickly and purposefully scales up the side of the tower. There is no safety net or rope to catch her if she falls. 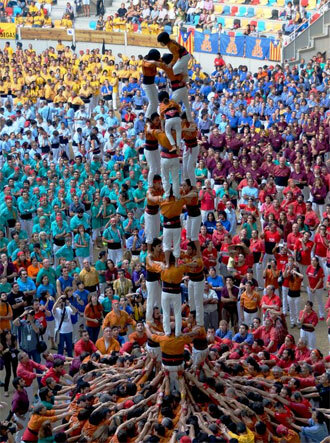 All the more nail-biting given it’s a human tower on which she precariously balances, seven human stories high, perhaps 12 meters tall, that is beginning to creak and sway. The buzz of the arena fades to a momentary silence as everyone looks to the barefoot girl in her traditional outfit – white trousers, cummerbund and team orange shirt, her ponytail trailing down her back beneath her safety helmet. The galles, primitive oboes, blast and drums rally her spirit, hurtling towards a crescendo. Thousands in the arena call out and chant in support. Then the whole stadium bursts into feverish cheers as the little girl reaches the top of the dizzyingly high apex, crouches on the shoulders of those beneath and raises her hand, crowning the tower – job done – or almost, she still needs to get down. She begins an immediate descent and reaches the base within a few seconds. The thick bough of people that forms the tower’s foundation reminds me of the nature-inspired patterns of Gaudí’s architecture. Without pause, the girl thrusts herself into the outstretched arms of her proud and relieved mother, who caresses and kisses her. The little girl is delirious with joy. She has learnt some of the most important lessons for a Catalan: “Strength, balance, courage and common sense” – the de facto essence of the Catalan spirit.